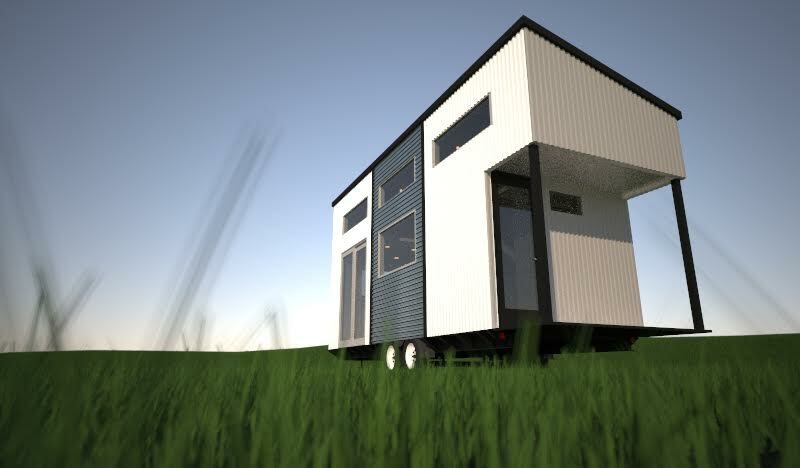 Here is the tiny house being built for my client right now by Tiny Green Cabins. The house is made with no wood whatsoever, including plywood and OSB! This is made for someone who cannot tolerate wood of any kind. She is extremely sensitive to offgassing and mould. Size is 8’ x 20’ x 12’-5 1⁄2” tall, with an approximate weight of 9k GVW. 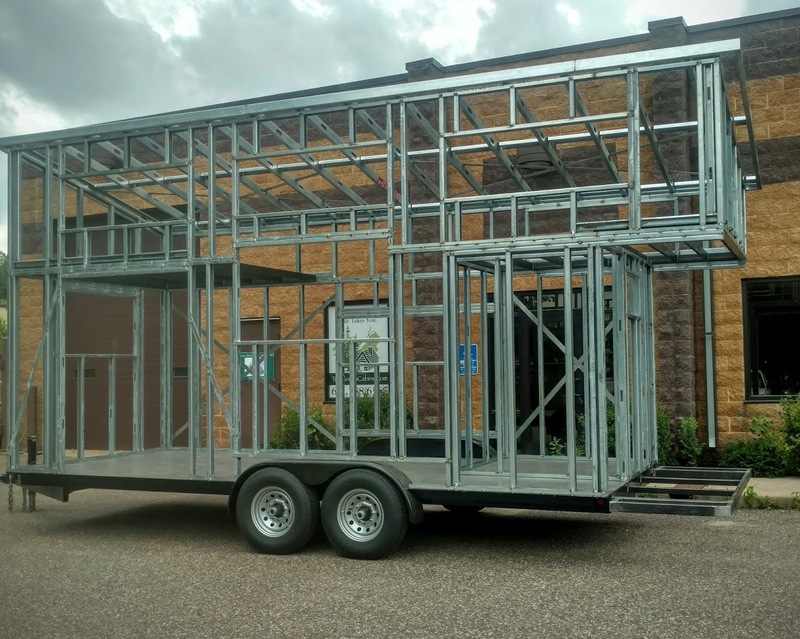 The trailer is a custom welded steel channel beam trailer. There are options for the paint used on the trailer. Steel Underbelly 2 x 4, 16 gauge joists. The cold-formed steel joists are bolted to the trailer frame. Walls are framed with 2 x 3 18 gauge cold formed steel studs @ 19.2 on center, fabricated with screws and welded connections. Rain screen (furring) is made of metal (Rain screen in important in case moisture does get into the walls). Roof structure is 18 gauge cold formed stacking above joists, fabricated with screws and welded connections. No wood used! The loft has metal floor sheathing. 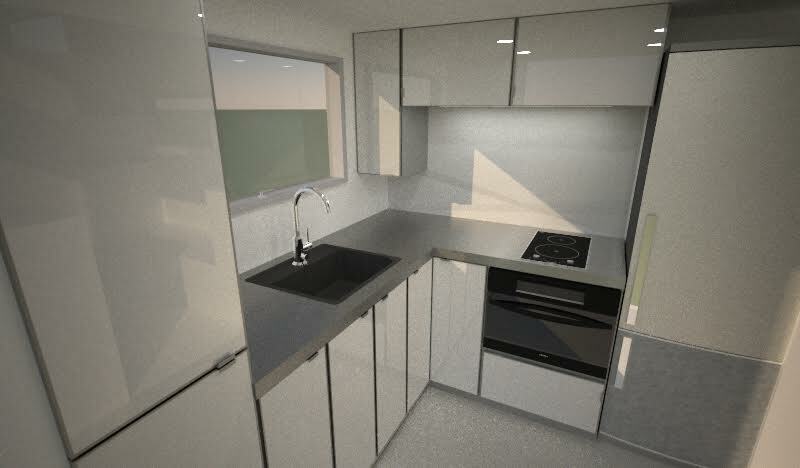 Kitchen has a stainless steel sink with metal cabinets and countertops. Other countertops options can be considered. There are a few options for windows. I prefer aluminum, but they cannot be sourced everywhere. There are other options that people tolerate well. Typar zero-VOC window flashing is being used. Fabral smooth painted steel to wrap the exterior walls, and Fabral “w” metal roofing for the roof. Metal at walls is riveted and steel roof and trims screwed. Fabral should be tested first to make sure the paint finish is tolerable. Other metal finishes are available with different brands. Interior walls are Fabral steel attached with screws. Interior comes in different colours, or can be painted later with metal primer and paint. Caulking is used to prevent water vapour from entering wall cavity. Metal flooring is 2 layers of 18 gauge steel layered. Foam is used as a thermal break and insulation. Doors are metal and glass. Insulation options are XPS foam or foil-backed polyiso. Foam is being used as exterior sheathing/thermal break as well. Other materials could be considered for insulation but riged foam was our top pick here. Tyvek tape is used to seal the sheathing if tolerated. They also used caulk on the inside side for an extra barrier to water vapour entering the walls. (This is a double vapour barrier - note the risk. Please consult with an architect if you can only tolerate metal and foam). Heating and cooling a 12-15,000 BTU inverter heat pump, Daikin LV series or Mitsubishi hyper-heat models installed by a HVAC company is recommended. Other heating options such as wall mounted electric heaters or propane RV heater/AC combos (off grid) could be used. Another propane option that is tolerable is a direct vent heater. For a hot water heater we are using propane on demand. This is the best way to go for water to keep the house to 50 amps or less. Exhaust fans are very important in an all metal house to keep the humidity as low as possible. In the bathroom it should be exterior mounted as to not leak moist air into the ceiling. An ERV could be a good option if you have a composting toilet (this depends on your climate as well). In the kitchen the exhaust fan needs to vent to the outside. A dehumidifier may also be needed if condensation forms on the walls or the mattress becomes damp (do not put a standard mattress straight on the ground). For appliances, a propane fridge should be considered to reduce electricity needs (2-way or 3-way refrigerators can be good depending on your needs and if you are incorporating solar). 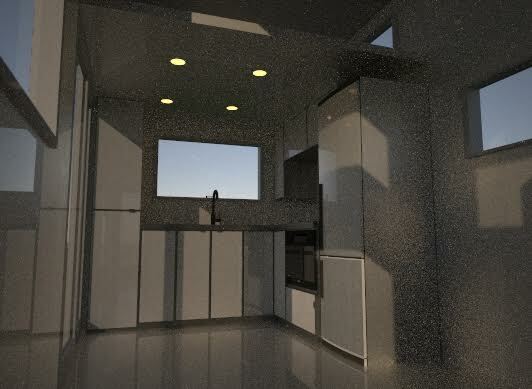 An apartment sized stove can be used or else a small convection oven with a cooktop. If you can tolerate propane or alcohol stoves those can be considered for an off the grid house. Flooring can be left as metal. Tiles can be considered although this would add considerable weight. Natural carpet or rugs can be considered as well to cover the metal. 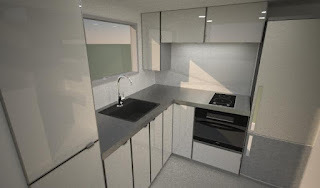 I can help you work with your builder to come up with a customised list of materials that will work for you and your tiny house. Please see my consulting page for more details and contact info. Tiny Green Cabins specialises in building for people with sensitivities. Thanks to Luke Skaff for help on the technical aspects. Always consult with an architect or engineer on moisture management in your building envelope. Any word on when they will start producing these or if anyone has tried one if they are available to purchase. This one pictured is just about finished. They are made to order. 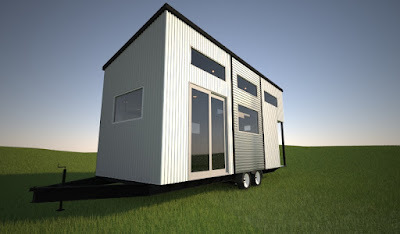 You can order one from any tiny house company or Tiny Green Cabins which made this one. Hi! What do these cost please? Fantastic site! Thank you for your information! This house was around 80K USD. Can you do these in aluminum? Con they be shipped to costa rica on a container ship? This company took so long to build and it would be difficult I think to manage this build from abroad. Though this house might still be for sale, check with Tiny Green Cabins. You will have to ask the companies and probably arrange international shipping yourself. Tiny Green Cabins has decided to no longer build nontoxic, chemical free tiny homes. You need to change your webpage to make that more clear. Also when people are inquiring to buy this house why are you telling them you don't have it?